1. Mehto S, Jena KK, Nath P, Chauhan S, Kolapalli SP, Das SK, Sahoo PK, Jain A, Taylor GA, Chauhan S. The Crohn's disease risk factor IRGM limits NLRP3 inflammasome activation by impeding its assembly and by mediating its selective autophagy. Molecular Cell. 2019.Feb 7;73(3):429- 445.e7. Aim: IRGM is genetically and functionally linked with protection against several chronic inflammatory diseases including inflammatory bowel disease (IBD), Crohn's disease (CD), leprosy, gastric cancer, chronic periodontitis, severe sepsis, and ankylosing spondylitis. The objective of this study is to define the mechanism by which IRGM is protective against these diseases. Key finding(s): This study show that IRGM inhibits NLRP3 inflammasome activation to keep the inflammation under check. This study provides a basis for the protective function of IRGM in inflammatory and autoimmune diseases in human. Strategy/Approach: The cell culture and animal models are used to discover the mechanism. Results and Conclusion: This study defined a direct role of IRGM in suppressing NLRP3 inflammasome and inflammatory diseases related to NLRP3. We found that IRGM suppresses IL-1β production by limiting the activation of the NLRP3 inflammasome. IRGM limits inflammasome activation by two mechanisms, (1) limiting assembly of inflammasome components and (2) mediating the autophagic breakdown of inflammasome components. IRGM/Irgm1 can protect from inflammation-induced cell death and can suppress gut inflammation in Crohn’s disease experimental mice model. Impact/Benefits: Mutations/dysregulation of NLRP3 have been linked with a range of auto-inflammatory and autoimmune diseases mostly characterized by increased production of IL-1β. So, for therapeutic purposes, it is of paramount importance to understand the mechanisms by which the cell restrains the activation of NLRP3 inflammasome and IL-1β production. This study define one of the important mechanisms by which IRGM suppress activation of NLRP3 inflammasome and IL-1β production. Currently, strategies (chemical and biological) are underway to increase IRGM activity so as to suppress inflammasomes for therapeutic purposes in inflammatory diseases. The strategies to target the IRGM-NLRP3 interaction as potential therapeutic interventions for IRGM- and NLRP3-associated diseases including Crohn’s is under consideration. Laymen Title: Understanding the mechanism of safe disposal of stress-induced proteins aggregates for increased survival of body cell: implication in neurodegeneration and cancer. Misfolded proteins are a common outcome of protein biosynthesis in our body cell, and about 30% of newly synthesized proteins end up misfolded. Normally, these misfolded proteins are ubiquitinated and degraded by the proteasome system and/or autophagy process. Multiple factors ranging from genetic mutations (in neurodegeneration) to cellular (oxidative/proteotoxic stress) and environmental stresses can trigger protein misfolding overwhelming the cellular capacity to clear them leading to their aggregation and accumulation resulting in many pathological conditions collectively termed as proteinopathies (Alzheimer’s, Parkinson’s, amyotrophic lateral sclerosis, etc.). On the flip side, a recent study showed that the augmented capacity to degrade the misfolded proteins alleviates oxidative stress associated with cancerous growth and is required for both the initiation and maintenance of malignant phenotypes (Chen et al. 2017, Cell reports). So the cancer cells hijack the machinery of protein quality control and utilizes them for their survival. Given the paramount importance of process (in neurodegeneration and cancer) of formation of protein aggregates from misfolded proteins and their subsequent degradation, it is vital to understand the mechanism by which turnover of protein aggregates takes place in the cell. Till date, the mechanism by which protein aggregates are formed and degraded in cell remains elusive. In this study, we discovered a novel mechanism by which cells during the oxidative or proteotoxic stress conditions can turn over the protein aggregates for their better survival. Two proteins namely, TRIM16 and NRF2 governs a protein machinery (p62 and ubiquitination) to regulate the process of protein aggregates formation and subsequently the TRIM16 engages autophagy machinery (a process of degradation in our cell) to degrade the protein aggregates. Thus, TRIM16 streamlines the process of stress-induced aggregate clearance and protects cells against oxidative/proteotoxic stress-induced toxicity. Thus, pharmacological targeting of TRIM16 for increasing its activity will be useful in neurodegeneration. On the flipside, we found that genetic knockout of this protein in cancer cells cripples their capability to handle oxidative stress or oncogenic stress leading to significant reduction in tumor size. Thus, pharmacological targeting of TRIM16 for decreasing its activity will be useful in killing cancer cells. The formation of protein aggregates is a hallmark of neurodegeneration. The accumulation of protein aggregates due to incapability of neurons to clear them leads to cell death and is linked to pathological conditions in neurodegenerative diseases. On the flipside, cancer cells are smart enough to degrade stress-induce protein aggregates by hijacking the protein quality control machinery and survive in worse stress conditions (in which normal cell will die). Understanding the mechanism of protein aggregates turnover will pave path for therapeutic interventions of neurodegeneration and cancer. In this study, we defined a novel mechanism by which cells handle stress-induced protein aggregates turnover. TRIM16 uses two-pronged approach for complete turnover of protein aggregates under stress conditions. It governs the NRF2 mediated anti-oxidant system, ubiquitin mediated protein folding machinery and autophagy-mediated degradation machinery to accomplish this task. Hence therapeutic targeting of TRIM16 could be useful in neurodegeneration and cancer. ​Polymorphisms in the IRGM gene, associated with Crohn disease (CD) and tuberculosis, are among the earliest identified examples documenting the role of autophagy in human disease. 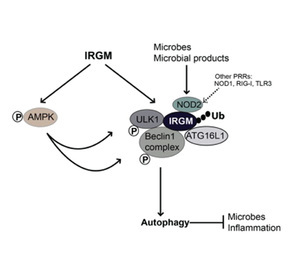 Functional studies have shown that IRGM protects against these diseases by modulating autophagy, yet the exact molecular mechanism of IRGM's activity has remained unknown. We have recently elucidated IRGM's mechanism of action. IRGM functions as a platform for assembling, stabilizing, and activating the core autophagic machinery, while at the same time physically coupling it to conventional innate immunity receptors. Exposure to microbial products or bacterial invasion increases IRGM expression, which leads to stabilization of AMPK. Specific protein-protein interactions and post-translational modifications such as ubiquitination of IRGM, lead to a co-assembly with IRGM of the key autophagy regulators ULK1 and BECN1 in their activated forms. IRGM physically interacts with two other CD risk factors, ATG16L1 and NOD2, placing these three principal players in CD within the same molecular complex. This explains how polymorphisms altering expression or function of any of the three factors individually can affect the same process - autophagy. Furthermore, IRGM's interaction with NOD2, and additional pattern recognition receptors such as NOD1, RIG-I and select TLRs, transduces microbial signals to the core autophagy apparatus. This work solves the long-standing enigma of how IRGM controls autophagy. A punctum to this paper is published in Autophagy Journal. Autophagy constitutes a major cell-protective mechanism that eliminates damaged components and maintains energy homeostasis via recycling nutrients under normal/stressed conditions. Although the core components of autophagy have been well studied, regulation of autophagy at the transcriptional level is poorly understood. In this paper, we establish ZKSCAN3, a zinc finger family DNA-binding protein, as a transcriptional repressor of autophagy. Silencing of ZKSCAN3 induced autophagy and increased lysosome biogenesis. Importantly, we show that ZKSCAN3 represses transcription of a large gene set (>60) integral to, or regulatory for, autophagy and lysosome biogenesis/function and that a subset of these genes, including Map1lC3b and Wipi2, represent direct targets. Interestingly, ZKSCAN3 and TFEB are oppositely regulated by starvation and in turn oppositely regulate lysosomal biogenesis and autophagy, suggesting that they act in conjunction. Altogether, our study uncovers an autophagy master switch regulating the expression of a transcriptional network of genes integral to autophagy and lysosome biogenesis/function. This paper was Highlighted in Cancer Discovery (AACR) journal, February 28, 2013; doi:10.1158/2159-8290.CD-RW2013-046. In this highlight the ZKSCAN3 is described as switch, controlling the autophagy and lysosome biogenesis. 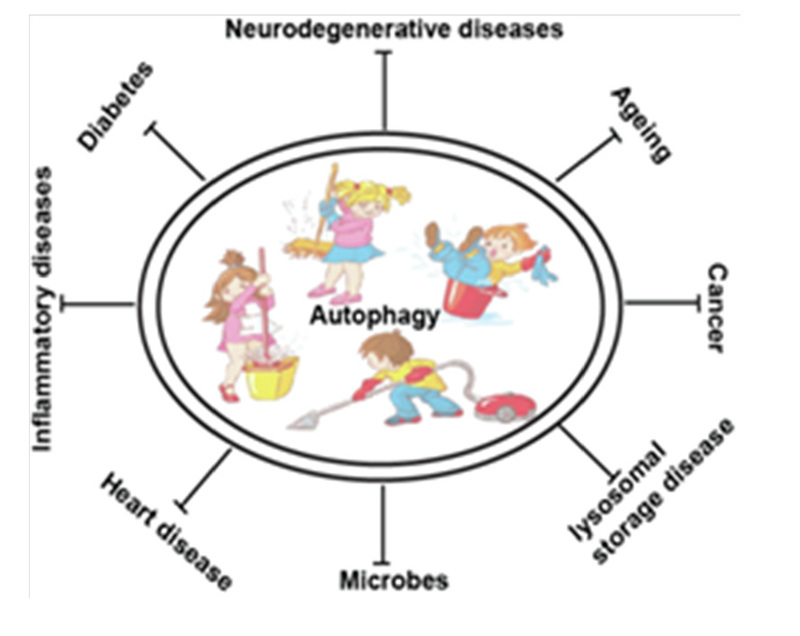 Autophagy is a conserved homeostatic process active in all human cells and affecting a spectrum of diseases. In this study, we use a pharmaceutical screen (>3000 FDA approved drugs) to discover new mechanisms for activation of autophagy. We identify a subset of pharmaceuticals inducing autophagic flux with effects in diverse cellular systems modelling specific stages of several human diseases such as HIV transmission and hyperphosphorylated tau accumulation in Alzheimer's disease. One drug, flubendazole, is a potent inducer of autophagy initiation and flux by affecting acetylated and dynamic microtubules in a reciprocal way. Disruption of dynamic microtubules by flubendazole results in mTOR deactivation and dissociation from lysosomes leading to Transcription Factor EB nuclear translocation and activation of autophagy. By inducing microtubule acetylation, flubendazole activates JNK1 leading to Bcl-2 phosphorylation, causing release of Beclin-1 from Bcl-2-Beclin-1 complexes for autophagy induction, thus uncovering a new approach to inducing autophagic flux that may be applicable in disease treatment.